Digital Content Production ... complete. It's time to move beyond the desktop tools of yesterday. IGP:Digital Publisher is the only system that can instantly deliver multiple print editions, multiple e-book editions AND sophisticated content packages for any business requirement. IGP:Digital Publisher (DP) is a complete digital content production and content management solution designed to address all the challenges publishers face in a fast changing digital content landscape. trade, academic, education, training, government, enterprise and business content publishers. Fiction and non-fiction trade books of all types, including complex layouts. Your print book can be mono while your digital formats can support full colour. Academic Includes books, journals and articles. Lists, notes, footnotes and index creation are all supported. Publish Online to a digital library with POD as an alternate format. For products, training and other government or corporate documentation. Student and instructor edition content can be maintained in the same master file and modified at any time. K-12 and Tertiary textbooks for print and digital delivery. With or without interactivity. Create supporting on-line/off-line learning and testing resources and SCORM packages instantly and easily. such as interactive and rich media e-books and supporting modules, sites or portals. The same application can create your print and ePubs AND supporting promotional and resource sites. Author, edit, review and approve template driven reports created by large online teams with geographical spread. Instantly publish the reports online web pages and/or as PDFs. IGP:Digital Publisher is the only publisher content production system that can instantly deliver multiple print editions, multiple e-book editions AND sophisticated content packages; from one master XHTML file (using IGP:FoundationXHTML); for any business requirement. ✔ Slash production costs, reduces book production complexities with a single standards controlled XHTML (FX-FoundationXHTML) master file for all formats. ✔ Import XML, processors enable any publishing XML to be mapped to FX and used instantly for format generation forever. ✔ Free from the desktop, all the tools for print production are built in. No requirement for any external desktop production tools. ✔ Increase productivity, production quality and business agility. One tool does it all. Production and editors can work from anywhere in the world on the same books. ✔ All the tools you need to instantly creates multiple formats from a single, controlled XHTML5 source file. No "optional extras". Everything is included. ✔ Full programmatic control over content, assets and translations. It is designed to ensure valuable publisher content will be available forever. ✔ Create all formats: Print PDF, Online PDFs, eBooks (EPUB, MOBI, Kindle, etc. ), Websites and other documents or packages from one HTML/CSS source. ✔ Be ready for a fast changing digital content future. IGP:Digital Publisher is easily extended as new business requirements emerge. Get the Brochure. PDF Doc or ePub3 Fixed Layout. IGP:Digital Publisher has comprehensive account, project and document management designed to easily manage hundreds of users and thousands of books/documents forever. IGP:Writer has all the tools for content and (X)HTML editing in every language and for all format requirements. There are processors for TOC, Notes, Footnotes and much more. Integrated IGP:Formats on Demand included. Produce all print, e-book and other formats instantly. Handle any number of generation tasks. Customize as required. IGP:Typography in the Browser provides the tools to simultaneously typeset multiple print editions from one master XHTML file. Typography Automation reduces manual workload. The integrated IGP:Media Manager application handles images for all formats, audio, video and more. Upload a print image and all e-book format images are generated automatically. IGP:Font Manager 2. A powerful CSS-3 tool that lets you manage and use fonts interactively. Handles OTF font features, font sub-setting, WOFF conversion, obfuscation and much more. IGP:Document Designer, a sophisticated CSS editor and Design Library included. Delivering interactive CSS styling, design and layout tools. The integrated IGP:Reader panel gives you an instant online, ebook and PDF views of the output at any time. No waiting for a processor. IGP:Digital Publisher exists to generate deliverable formats instantly. Generate PDFs, e-Book formats, previews and specialist packages with a single click at any time during the production process. IGP:Digital Publisher is always ready to deliver. Import manuscripts for near instant format generation. Customize word-processor styles to match house requirements. Manuscripts can contain images and complex layouts. Old ePub files can be imported, restyled, value added and upgraded for ePub3, Kindle KF8 and any other format. You legacy content can be ready for any future changes, requirements or new formats. Get out of the DocBook rut. If you have legacy files import them and upgrade to the amazing IGP:FoundationXHTML. ePub3 has become the new accessibility standard. You can import existing files and republish them as ePubs. Legacy XML can cross walk and handle the most complex XML DTDs or Schemas. Content management is built on a trusted and maintained XHTML(5) tagging pattern strategy. We call it IGP:FoundationXHTML (FX). FX has been used and maintained since 2007 to produce millions of pages of content in all genres for hundreds of publishers around the world. Not proprietary. It's a controlled and maintained foundation that can be built on for any other requirement (similar to XML but without the punitive costs and inflexiblity). Flexibility and customization is built in at every point in IGP:Digital Publisher. Quickly define your own requirements. If you have existing XML files that have become unusable they can easily be imported and crosswalked to FX so all content is the same and brought back to life. It is the quality of IGP:FoundationXHTML that ensures consistent, reusable, high quality content while providing the production cost savings delivered by IGP:Digital Publisher. 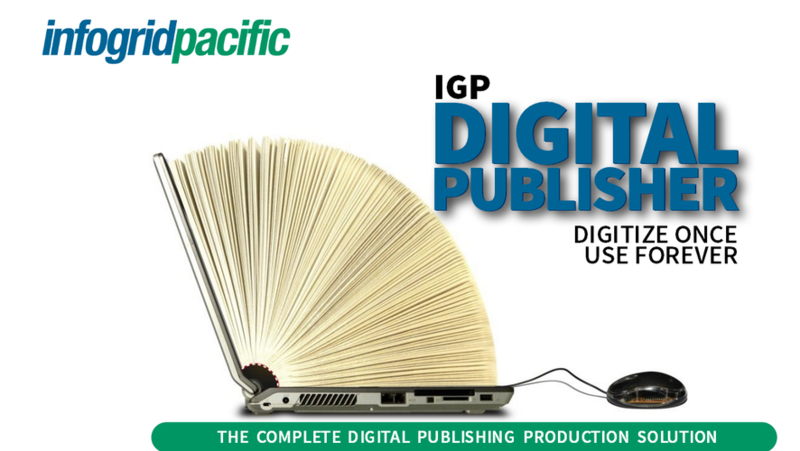 IGP:Digital Publisher User Manuals are maintained and available online. Visit these documents to understand all the amazing features. Click on these links to learn more about IGP:Digital Publisher. Each document has a introduction and/or quick start section. All of these applications are integrated into a single production framework.